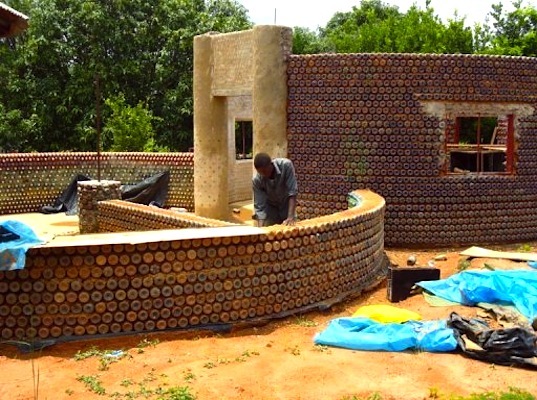 With a serious housing shortage but no shortage of plastic bottles littering the streets, the Development Association for Renewable Energies (DARE) – an NGO based in Nigeria – decided to build this incredible two-bedroom bungalow entirely out of plastic bottles! Although many in Kaduna were dubious when the project began construction in June this year, the nearly-complete home is bullet and fireproof, earthquake resistant, and maintains a comfortable interior temperature of 64 degrees fahrenheit year round! Hundreds of plastic bottles were filled with sand and then linked together at the neck by an intricate network of string. The bottles were then strategically laid and packed down with a combination of mud and cement, creating a building material that DARE claims is stronger than cinder blocks! The multi-colored bottle caps extend from the 624 square foot bungalow’s wall, creating a facade that gives an otherwise dull building a lovely splash of color. DARE received assistance from African Community Trust, a London-based NGO, and hopes to roll out similar buildings in the future. This project has the potential to not only improve the housing shortage, but clean up the streets as well! Excellent use of natural and unnatural resources. I love this, and I really want to do it myself. Anyone know where I might find pictures of the finished house ? what address could I send donations of bottles and supplies to ? This is real architecture. Beautiful. So glad that I saw this post - now I know what next year's raised garden beds will be made of! After just two years of completion, I would like to know how the construction is reacting and what are the strongest and the weakest points in it right now. Only observing and analysing the behaviour of a structure during its lifespan one can take advantage of the experience. It is still too early but some lessons are already possible to learn. All theoretical solutions are good until the prove in real conditions. So, I would like to know: 1. How much does cost the whole construction? 2. Some detail are welcome: human work/time needed if not paid, new materials such as sanitary, windows and doors, floors, roofs, concrete used, etc; 2. Total time consumed; 3. Weather conditions during these two years and structure reaction; 4. Pros and cons of this experiment, after two years of use. Thaks in advance for the answers. Yeah, Montium, that was a little dumb. I skimmed. :=} Still ... cool idea. http://www.youtube.com/watch?v=LPxXH7rCSHQ This is a video showing a bottle building actually being built. I would think you could use some sort of conduit for wiring, and maybe do the roof differently in a colder climate. It would also be easy to add a composting toilet, and use some bottles or cans for solar heat. I've seen videos of plastic bottles used for allowing light to come in, in the roof. Do you have any idea whether the bottles are filled with dirt or sand? The uniform color makes me think that they are, and that would certainly make the structure more stable. I'd love to find out more details about the construction. What a great idea! I want to know how to build one. This is great! What makes it bullet and fireproof, earthquake resistant, and maintains a comfortable interior temperature of 64 degrees fahrenheit year round! what is the roof structure comprised of? Like the gentleman from Pakistan said, I'd really like to see detailed instructions, not just some googled pictures. I know, I'm asking someone to do a lot of work here but think of the good an all inclusive pdf could do in the world. Maybe some YouTube videos too. Either way, thank you for sharing. This is proven to be a good job well done. I\\\'m wondering how well those plastic bottles would hold up if they were filled with water? If that were done, then more light would be able to be let in the house. This should be shown to the leaders of every country facing housing difficulties worldwide! I see a potential problem here. Most of the plastics used eventually become brittle with long-term exposure to the UV in sunlight. Similar techniques using glass bottles and aluminum cans don't have that particular problem. A simple solution might be to use an appropriate paint or stucco coating on the exposed plastic. While a stucco coating may not stick well to the plastic, inserting small sticks or stones between the bottles that stuck out a little way would provide suitable anchoring, much the way the ancient Mayans did for coating the walls of some of their structures. I am so happy to see this! I work in various African countries with AIDS orphans and this would be amazing for any of them to live in. Or, for me, when we are in Africa! Wow...wonderful work. Wow! Amazing! 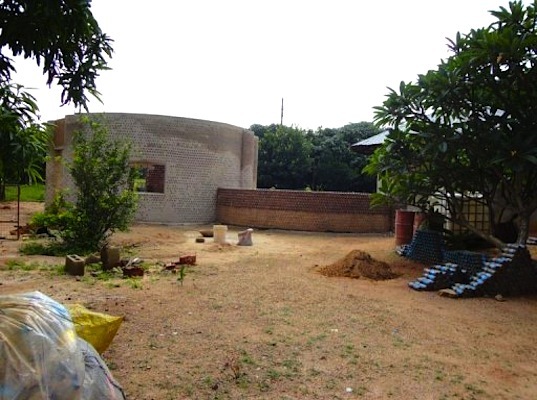 We've been using Earthbag Construction in Zambia, but this is a GREAT concept also! Hmmm similar to earthships but less labour intensive! Simply amazing! I wish for this here in Tunisia. Sadly, many people don\\\'t have the open mind it takes to try such construction ideas as this. I see plastic everywhere here and have wished for a solution in using it for something long lasting and purposeful. Way to go DARE! I can\\\'t wait to see the finished product here if you will kindly post photo\\\'s of the finished home. God Bless! what about vertical and horizontal joints? How does the ceiling cover up? HI BitemeKangeze John, what are you basing your comments on? If it is opinion then please allow me to give you what we know so far as fact. The bottles do not react in anyway whatsoever to the binding material. Why should they? Even if water or air is involved in this, how would that play any negative factor? Ay any rate, the bottles are sealed up in a wall so there is none of either. Most of the projects built in Latin America have been through multiple hurricanes and an earthquake. There have been no issues with ANY of these constructions as a result. We argue that continuing to build using unbelievably expensive, non sustainable and wasteful techniques is what is crude. I really take exception to you total negativity. This offers a true solution. I invite you to please research any of our sites for background information and I hope you will see that the thousands of people effected by Andreas's building technique are not being duped. No-no-no!!!!!!!!! Crude technology, for sure! Can someone else there tell me what the portland cement is made of? Mainly, calcareous materials (limestone, marble, corals- i.e CaCO3). A plastic bottle should be very reactive when in contact with a cement, especially in the presence of water or air. People believe me; these houses will not last longer. I love this! This is such an inspiration and such a breath of fresh air from all of the fear that's being pumped to us daily about "the coming economic collapse!!!" and "the end of the world as we know it!!!" blah blah. Ingenuity like this reminds me that we did it once...we can and will do it again. This is amazing! Along time ago, I read an article in which founder of Heineken Beer attempted to do this is South America and thought it was brilliant then... I even wondered why noone else had done this since (nearly, 1939? whe he did). Heineken bottles were actually made in a triangle shape for this purpose -building sustainable homes. Now, if we could only get plastic pottle makers to create a bottle shape that was similar! The round bottles look great too! By looking at the plastic bottle home all I can say is "Glory be to the Creator". That is pure creativity from the brain. Hi. Please google 'ecotec plastic bottle construction' and you will find many links with images from different blogs and websites. Also please look at www.ecotecnologia.com for more images. Andreas has also built a tank for fish farming using PET bottles filled with plastic waste such as plastic bags and packaging. Fill a bottle with plastic at your own house and you will be amazed at how many plastic bags you can get into a 500 ml bottle. I really enjoy these articles but there is a so little pictures 3 pictures for something a great as this? Hi. I am the Project Director in Uganda for the company responsible for this construction method. I just want to answer an earlier comment - our constructions uses traditional roofing, in Nigeria I assume that will mean iron sheets (as it is here in Uganda). We also in many cases use traditional foundations as well though it is possible to use construction waste (also a huge landfill issue) and bottles in foundation construction, therefore using less cement. Thanks for your interest very much. This is really awesome, now we just need to collect the millions of bottles floating in the ocean and do something like this with them. Fantastic idea, inventive use of disposables that now become reusables - bravo! With a serious housing shortage but no shortage of plastic bottles littering the streets, the Development Association for Renewable Energies (DARE) - an NGO based in Nigeria - decided to build this incredible two-bedroom bungalow entirely out of plastic bottles! Although many in Kaduna were dubious when the project began construction in June this year, the nearly-complete home is bullet and fireproof, earthquake resistant, and maintains a comfortable interior temperature of 64 degrees fahrenheit year round!